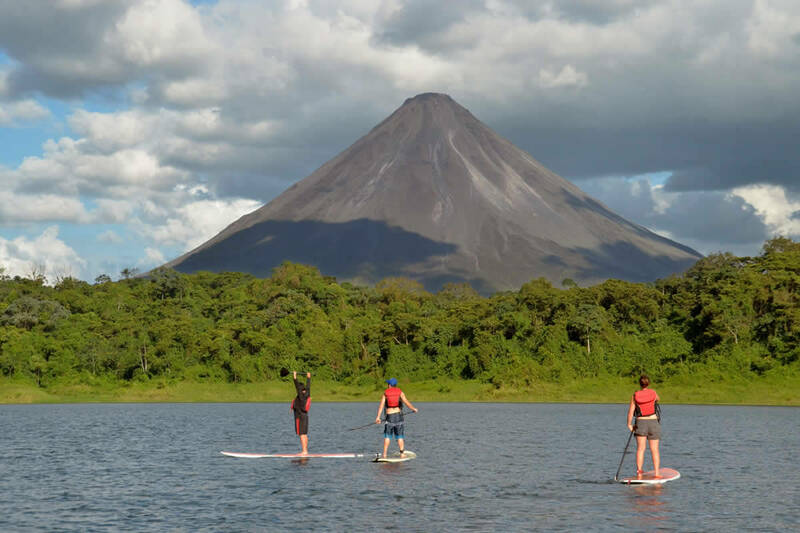 SUP with Great Volcano views! Venture to Costa Rica's largest lake and hop on board our private boat as your guide and captain load up with stand up paddle gear and a cooler full of icy bottled water and fresh fruits. As we embark on our journey out to the middle of Lake Arenal, you'll be blown away by all of the natural beauty of Volcano Arenal. The mountains that surround the lake are different shades of green, as some are in the foreground while the others fade into the distance. At first, the Arenal Volcano seems like it is hidden behind mountains, but if you get to a certain part in the lake you've reached the sweet spot – a spot where you can see the detailed textures of its rock formation and where passing in front of it can make you feel tiny. When you reach the middle of the lake, your guide will give you plenty of safety instructions and plunk your board into the water. Paddle out on your knees and when you are ready, stand up and find your balance! 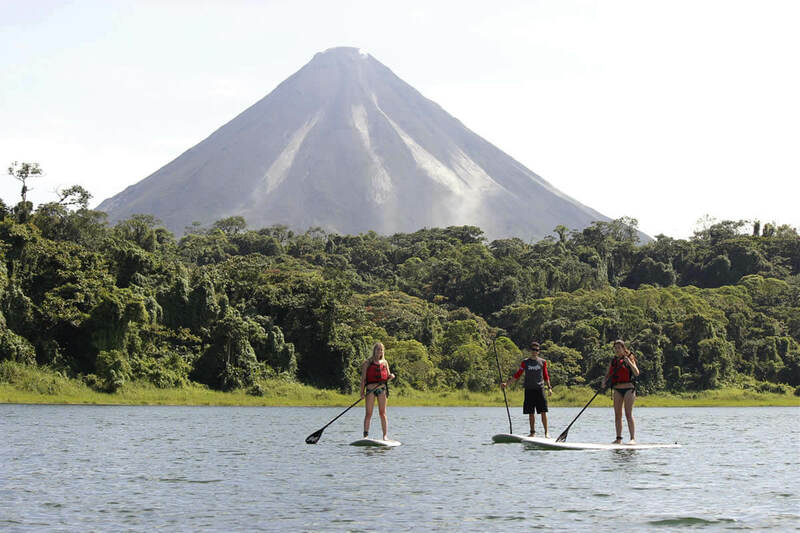 The calm waters in Arenal make this a perfect sport for people of all ages and all skill levels. It's a great activity for people who just want to be on a freshwater lake, soaking up the sun in gorgeous scenery with plenty of opportunity for conversation. About half way through the tour we'll paddle to an island where you can relax, crack open the cooler, and fuel up with a refreshing and well-deserved snack. Que Rico! Professional suspension mountain bike, Helmet, Gloves, Transportation, Bilingual biking guide, Drinks and snack. Sun block, Swimming suit, Towel, Eyeglass straps or contact lenses, T-shirt and shorts to get wet in. As many of the hotels are located quite far in Arenal, a small tranportation fee may apply.